Iterator is a special type of module that converts an array into a series of bundles. Each array item will be outputted as a separate bundle. Setting up an iterator is done in the same way as setting any other module. The Array field contains the array to be converted/split into separate bundles. The below scenario shows how to retrieve emails with attachments and save the attachments as single files in a selected Dropbox folder. Emails can contain an array of attachments. The Iterator module inserted after the first module will enable you to handle each attachment separately. 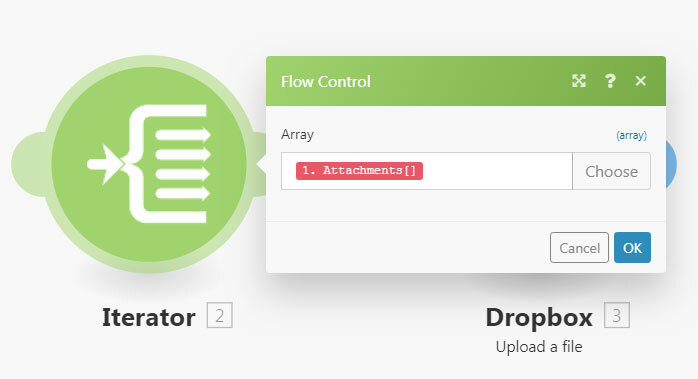 The Iterator will split the array of attachments into single bundles, each bundle with one attachment will then be saved one at a time in a selected Dropbox folder. The Iterator module set up is shown above - the Array field should contain the Attachments array. For your convenience, many Integromat apps offer specialized iterator modules with a simplified setup. For example, the Email app contains the special iterator Email > Iterate attachments that will produce the same results as the general Iterator without having to specify the array, just the source module. The video below is module 1 of the 3 part lesson titled Iterator and Array Aggregator. It explains the purpose of the Iterator and the Array Aggregator and with the help of a sample scenario, explains when to use an Iterator and what to do with the output. The reason for this is that in Integromat each module is responsible for providing information about items it outputs so these items can be properly displayed in the mapping panel in the following modules. However, there are several modules that might be unable to provide this information in some cases, e.g. JSON > Parse JSON or Webhooks > Custom Webhook modules with missing Data structure. The solution is to manually execute the scenario to make the module learn about the items it outputs so it can provide the information to the following modules. To resolve this, just manually start the scenario in the scenario editor. You can un-link the modules after the JSON > Parse JSON module to prevent the flow from proceeding further or right-click the JSON > Parse JSON module and choose "Run this module only" from the context menu to execute only the JSON > Parse JSON module. To make the long story short: if you cannot see some items in a module's mapping panel, simply run the scenario once so all the modules can learn about the items they output and provide this information to the following modules.